Cabatuan National Comprehensive High School. Ang Sinag, June 2007-October 2007. Cabatuan National Comprehensive High School. Provided, scanned and sent by Joan Mababangloob. ARROYO GOES TO THE U.S.
PGMA gives last minute instructions as she leaves for U.S. COURTESY CALL BY U.S. DEPUTY SECRETARY JOHN NEGROPONTE ON PRES. ARROYO IN WASHINGTON D.C.
A helicopter assigned to Helicopter Anti-Submarine Squadron (HS) 4 and its crew prepare for another day of humanitarian relief for the Republic of the Philippines aboard the Nimitz-class aircraft carrier USS Ronald Reagan (CVN 76). Bottles of water transported from the Nimitz-class aircraft carrier USS Ronald Reagan (CVN 76) are unloaded by Armed Forces of the Philippines (AFP), U.S. Navy personnel and civilians. The supplies will be distributed throughout devastated areas caused by Typhoon Fengshen. Capt. Thomas P. Lalor, right, deputy commander, Carrier Air Wing (CVW) 14, gives Lt. Ralph Silvas directions to the area he is to deliver humanitarian supplies to on Panay Island. Lalor is coordinating air operations for the Ronald Reagan Carrier Strike Group while they assist the Republic of the Philippines in the wake of Typhoon Fengshen. A member of the Philippine Army carries bottled water to a waiting helicopter assigned to Helicopter Anti-Submarine Squadron (HS) 4 at Iloilo airport. The U.S. Navy and the Philippine Army and Air Force have been working side by side during disaster relief in the wake of Typhoon Fengshen. Aviation Warfare Systems Operator 2nd Class Anthony Chavez, of San Bernardino, Calif., looks over flooded areas in the Republic of the Philippines caused by Typhoon Fengshen. Riding in an SH-60F Seahawk assigned to the "Black Knights" of Helicopter Anti-Submarine Squadron (HS) 4, Chavez is part of the relief efforts of the Nimitz-class aircraft carrier USS Ronald Reagan (CVN 76). Aviation Warfare Systems Operator 2nd Class Anthony Chavez, of San Bernardino, Calif., looks out from an SH-60F Seahawk assigned to the "Black Knights" of Helicopter Anti-Submarine Squadron (HS) 4 onto the weather deck of the Arleigh Burke-class destroyer USS Howard (DDG 83) as it prepares to refuel and continue delivering food and water to devastated areas in the Republic of the Philippines caused by Typhoon Fengshen. The supplies are being delivered from the Nimitz-class aircraft carrier USS Ronald Reagan (CVN 76). Kalibo is in the northern part of Panay Island and was greatly affected by Typhoon Fengshen. Areas surrounding Kalibo are still flooded. 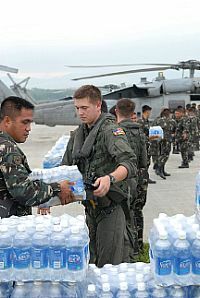 Servicemen of the Philippine Army stage themselves to transport bottled water to aircrafts assigned to the U.S. Navy and the Republic of the Philippines Air Force. The U.S. Navy and the Philippine Army and Air Force have been working side by side during disaster relief in the wake of Typhoon Fengshen. High above Roxas, standing water is visible after the wake of Typhoon Fengshen. 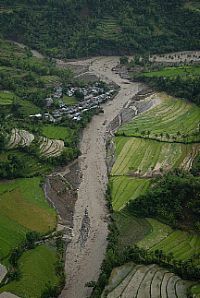 The northern part of the island was heaviest hit by the typhoon. High above Roxas, standing water is visible after the wake ofTyphoon Fengshen. The northern part of the island was heaviest hit by the typhoon. 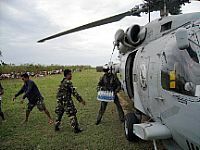 Servicemen of the Philippine Army transport bottled water from an SH-60 helicopter assigned to Helicopter Anti-Submarine Squadron (HS) 4 at Roxas airport. The U.S. Navy and the Philippine Army and Air Force have been working side by side during disaster relief efforts in the wake of Typhoon Fengshen. Raymar Rebaldo, mayor of Kalibo, center, receives food and water delivered from the Nimitz-class aircraft carrier USS Ronald Reagan (CVN 76) to be distributed throughout his town, an area in devastation after the effects of Typhoon Fengshen. Armed Forces of the Philippines (AFP), U.S. Navy personnel, and civilians worked together to unload the cargo. 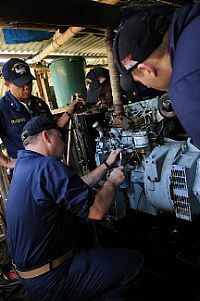 Master Chief Engineman Joseph Matteo, center, Chief Warrant Officer Zosimo Francisco, left, Electrician's Mate 2nd Class Dante Pine, and Engineman 2nd Class Shane Whittington troubleshoot a fuel pump on a generator at Barotac Viejo Regional Hospital in Iloilo. The Sailors, assigned to Engineering Department aboard the Nimitz-class aircraft carrier USS Ronald Reagan (CVN 76), have been inspecting, troubleshooting and repairing generators at hospitals in need of clean water and electricity after Typhoon Fengshen. 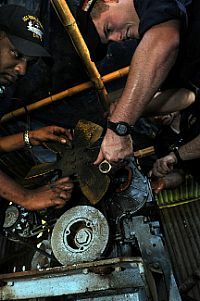 Engineman 2nd Class Shane Whittington, of Quitman, Texas, right, and Electrician's Mate 2nd Class Dante Pine, of Compton, Calif., remove a fuel pump on a generator at Barotac Viejo Regional Hospital in Iloilo. The Sailors, assigned to Engineering Department aboard the Nimitz-class aircraft carrier USS Ronald Reagan (CVN 76), have been inspecting, troubleshooting and repairing generators at hospitals in need of clean water and electricity after Typhoon Fengshen. Master Chief Engineman Joseph Matteo troubleshoots a fuel pump on a generator at Barotac Viejo Regional Hospital in Iloilo. Matteo and other Sailors assigned to the Engineering Department aboard the Nimitz-class aircraft carrier USS Ronald Reagan (CVN 76) have been inspecting, troubleshooting and repairing generators at hospitals in need of clean water and electricity after Typhoon Fengshen. Members of the Armed Forces of the Phillipines (AFP) load an HH-60H Seahawk assigned to the "Black Knights" of Helicopter Anti-Submarine Squadron (HS) 4 with boxes of food at Iloilo Airport. The U.S. Navy and the AFP have been working side by side during disaster relief efforts in the wake of Typhoon Fengshen. Aviation Warfare Systems Operator Airman John Baker, of Tampa, Fla., left, and Chief Aviation Warfare Systems Operator Drew Smith, of Newcastle, Del., assigned to the "Black Knights" of Helicopter Anti-Submarine Squadron (HS) 4, toss candy to residents of Alimodian. The U.S. Navy and the Philippine Army and Air Force have been working side by side during disaster relief efforts in the wake of Typhoon Fengshen. Aviation Boatswains Mate (Handler) 2nd Class William Sum unloads bottled water during relief efforts in wake of Typhoon Fengshen. 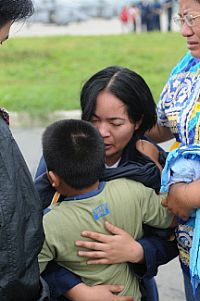 Petty Officer Sum, a native of Panorama City, Calif., is assigned to USS Ronald Reagan (CVN 76) and is ashore at the Kalibo Airport directing U.S. helicopters arriving with supplies. Air crews assigned to Helicopter Anti-Submarine Squadron (HS) 4 have been working long hours for five days delivering food and water to Panay Island, Republic of the Philippines in the wake of Typhoon Fengshen. From left, Aviation Warfare Systems Operator Justin Irwin, 23, Pleasant Hill, Mo, and Aviation Warfare Systems Operator Jeremy Thomas, 27, Warren, Ohio, grab a quick meal between refueling and airlift missions. U.S. Navy and Philippine Army servicemen working together with their Philippine counterparts at the Kalibo Airport to get water and supplies to people affected by Typhoon Fengshen. 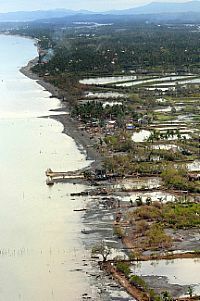 The coast of Kalibo on the northern tip of Panay Island was hit hard by Typhoon Fengshen and is receiving disaster relief assistance from the Ronald Reagan Carrier Group. 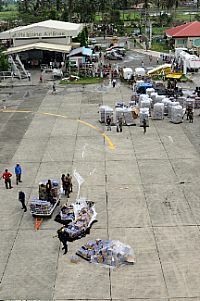 Servicemen from both the Philippine Air Force and Army unload a C-130 aircraft of food and water for transfer to waiting U.S. helicopters, which will deliver to remote locations throughout Panay Island. 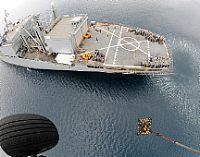 A HH-60H Seahawk helicopter from Helicopter Anti-Submarine Squadron (HS) 4 lifts another pallet of bottled water from the deck of Military Sealift Command combat stores ship USNS Niagara Falls (T-AFS 3) for delivery to Kalibo, Republic of the Philippines. Kalibo is on the northern tip of Panay Island and was hit hard by the typhoon. 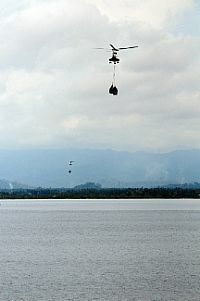 A HH-60H helicopter from Helicopter Anti-Submarine Squadron (HS) 4 delivers another pallet of bottled water from the deck of USNS Niagara Falls (T-AFS 3) for delivery to the northern tip of Panay Island. Sailors from USS Ronald Reagan (CVN 76) were flown out to assist in the vertical replenishment (VERTREP) and are working together with their Philippine counterparts to get water to the people affected by Typhoon Fengshen. A HH-60H Seahawk helicopter from Helicopter Anti-Submarine Squadron (HS) 4 transports another pallet of bottled water from the deck of Military Sealift Command combat stores ship USNS Niagara Falls (T-AFS 3) for delivery to Kalibo, Republic of the Philippines. Kalibo is on the northern tip of Panay Island and was hit hard by the typhoon. Armed Forces of the Philippines, Chief of Staff, Gen. Alexander B. Yano shares a handshake with Lt.j.g. Eduardo Vargas. Gen. Yano flew aboard USS Ronald Reagan (CVN 76) along with the U.S. Ambassador to the Philippines Kristie Kenney to thank the crew for their participation in the Philippine Relief effort. 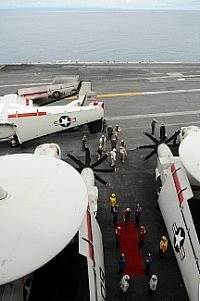 As the jet blast deflectors retracts, flight deck personnel get ready to hook up the next aircraft on catapult 2, seconds after an F/A-18 jet is catapulted off the flight deck of the Nimitz-class aircraft carrier USS Ronald Reagan (CVN 76). As humanitarian efforts for the people of the Republic of the Philippines continued throughout the day, Ronald Reagan also conducted routine flight operations. Flight deck personnel stand by as last minute maintenance is performed on an SH-60F Seahawk assigned to the "Black Knights" of Helicopter Anti-Submarine Squadron (HS) 4 on the flight deck of the Nimitz-class aircraft carrier USS Ronald Reagan (CVN 76). The "Black Knights" have been a key part of the recent relief efforts for the typhoon that struck the Republic of the Philippines, moving both personnel and supplies wherever and whenever needed. 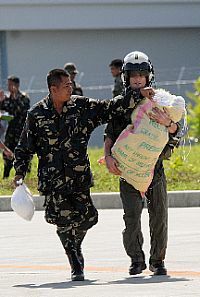 Lt. Brandon Sheets, right, carries a 100-pound sack of rice while a soldier from the Armed Forces of the Philippines lends a hand trying to keep the bag closed. The rice will be delivered to the remote location of Binglusan on the island of Panay. Aviation Warfare Systems Operator 2nd Class Travis Story, a native of Reading, Calif., waives goodbye to children at a school in the remote village of Altavas. Story is a helicopter pilot with the "Black Knights" of Helicopter Anti-Submarine Squadron (HS) 4 embarked aboard the aircraft carrier USS Ronald Reagan (CVN 76) and has been flying on relief missions to remote areas on the island delivering food and water. Aviation Warfare Systems Operator 2nd Class Travis Story, a native of Reading, Calif., carries a 100-pound sack of rice to a school in the remote village of Altavas. Story is a helicopter pilot with the "Black Knights" of Helicopter Anti-Submarine Squadron (HS) 4 embarked aboard the aircraft carrier USS Ronald Reagan (CVN 76) and has been flying on relief missions to remote areas on the island delivering food and water. The guided-missile frigate USS Thach (FFG 43) steams in the Sulu Sea as part of the Ronald Reagan Carrier Strike Group. The frigate is on station to refuel helicopters that have been air-lifting food and water to remote locations on the Philippine Island of Panay. 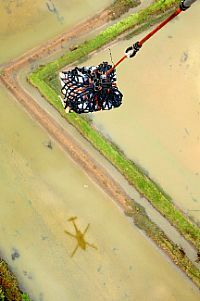 Soldiers with the Armed Forces of the Philippines carry relief supplies to a waiting SH-60F Seahawk assigned to Helicopter Anti-Submarine Squadron (HS) 4 for delivery to remote locations on the island of Panay, Philippines. Tents, hygiene items and water are to be dropped off in the Municipality of Balasan, which was hit hard by Typhoon Fengshen. Aviation Warfare Systems Operator 2nd Class Justin Irwin, a native of Pleasant Hill, Mo., hands a citizen from the Municipality of Balasan, Philippines a box of humanitarian relief supplies. Irwin is a helicopter crewman with the "Black Knights" of Helicopter Anti-Submarine Squadron (HS) 4 embarked aboard the aircraft carrier USS Ronald Reagan (CVN 76) and has been flying missions to the island delivering food and water in the wake of Typhoon Fengshen. Aviation Warfare Systems Operator 2nd Class Jeremy Thomas, a native of Warren, Ohio, carries supplies to local citizens of Balasan, Philippines. Thomas is a helicopter crewman with the "Black Knights" of Helicopter Anti-Submarine Squadron (HS) 4 embarked aboard the aircraft carrier USS Ronald Reagan (CVN 76) and has been flying missions to the island delivering food and water in the wake of Typhoon Fengshen. 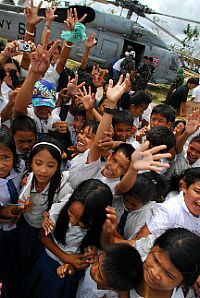 Residents from the Municipality of Balasan, Philippines wave and cheer after Sailors assigned to the "Black Knights" of Helicopter Anti-Submarine Squadron (HS) 4 deliver supplies. The crew has been flying missions to the island delivering food and water to remote cities like Balasan. Citizens from the Municipality of Balasan, Philippines wave after receiving supplies from air crewmen assigned to the "Black Knights" of Helicopter Anti-Submarine Squadron (HS) 4 embarked aboard the aircraft carrier USS Ronald Reagan (CVN 76). The "Black Knights" are flying missions to the island delivering food, water and other humanitarian supplies in the wake of Typhoon Fengshen. Aviation Warfare Systems Operator 2nd Class Jeremy Thomas, a native of Warren, Ohio, waves to citizens of the Municipality of Balasan, Philippines after delivering hygiene items, water and tents to the remote city. Thomas is a helicopter crewman with the "Black Knights" of Helicopter Anti-Submarine Squadron (HS) 4 embarked aboard the aircraft carrier USS Ronald Reagan (CVN 76) and has been flying missions to the island delivering food and water in the wake of Typhoon Fengshen. Rear Adm. James P. Wisecup, commander of the Ronald Reagan Carrier Strike Group, speaks with Philippines President Gloria Macapagal-Arroyo. Arroyo thanked Wisecup for the support the U.S. Navy is giving the Philippines during relief efforts in the wake of Typhoon Fengshen. Capiz to create "Save Coconut Task Force"
Service members assigned to the Philippine Army load an SH-60 Seahawk assigned to the "Black Knights" of Helicopter Anti-Submarine Squadron (HS) 4 with boxes of food at Iloilo Airport. The U.S. Navy and the Philippine Army and Air Force have been working side by side during disaster relief efforts in the wake of Typhoon Fengshen. Aviation Structural Mechanic 2nd Class Myron Robertson, of Carson, Calif., stacks supplies onto a cart at Kalibo Airport while a C-2A Greyhound is unloaded. The supplies, delivered by the "Providers" of Fleet Logistics Combat Support Squadron (VRC) 30 from the Nimitz-class aircraft carrier USS Ronald Reagan (CVN 76), will be distributed to those in need after the wake of Typhoon Fengshen. Aviation Structural Mechanic 2nd Class Myron Robertson, of Carson, Calif., helps local Philippine residents push a cart full of supplies at Kalibo Airport. The supplies, delivered by the "Providers" of Fleet Logistics Combat Support Squadron (VRC) 30 from the Nimitz-class aircraft carrier USS Ronald Reagan (CVN 76), will be distributed to those in need after the wake of Typhoon Fengshen. Aviation Warfare Systems Operator 1st Class Brian Anderson, of Spartanburg, S.C., assigned to the "Black Knights" of Helicopter Anti-Submarine Squadron (HS) 4 hands out candy to a group of Philippine children while the rest of the crew delivers supplies to the residents of Pande Axucar Island. The U.S. Navy and the Philippine Army and Air Force have been working side by side during disaster relief efforts in the wake of Typhoon Fengshen. Aviation Warfare Systems Operator 1st Class Brian Anderson, of Spartanburg, S.C., helps service members assigned to the Philippine Army load a C-2A Greyhound with supplies from the Nimitz-class aircraft carrier USS Ronald Reagan (CVN 76) at Iloilo Airport. The supplies will be transferred to Kalibo Airport to be distributed to those in need after the wake of Typhoon Fengshen. Service members assigned to the Philippine Army and Sailors assigned to the "Black Knights" of Helicopter Anti-Submarine Squadron (HS) 4 load an SH-60 Seahawk with cases of water at Iloilo Airport. The U.S. Navy and the Philippine Army and Air Force have been working side by side during disaster relief efforts in the wake of Typhoon Fengshen. 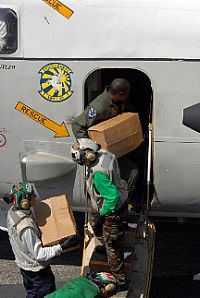 Service members assigned to the Philippine Army load a C-2A Greyhound with supplies from the Nimitz-class aircraft carrier USS Ronald Reagan (CVN 76) at Iloilo Airport. The supplies will be transferred to Kalibo Airport to be distributed to those in need after the wake of Typhoon Fengshen. Martin Teofilo Delgado or Martin Bermejo Delgado?